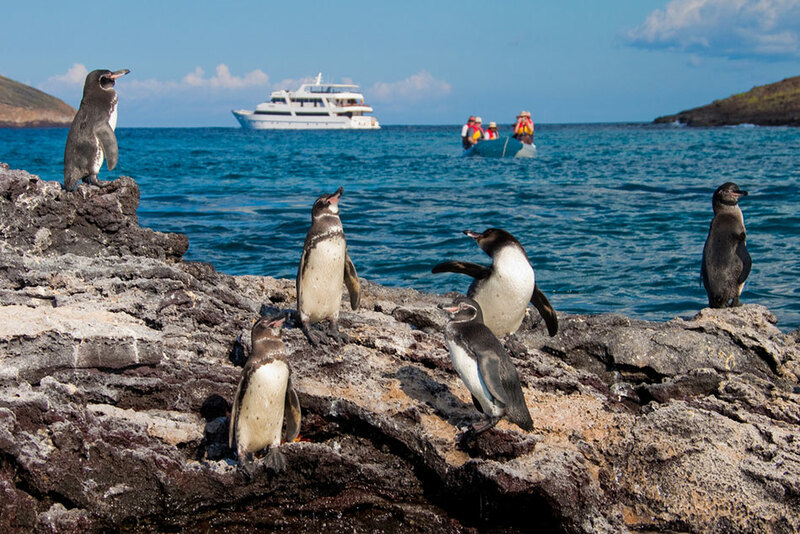 This day you will fly from Quito, Ecuador to the Galapagos. Due to the Galapagos Government, a fee of 20 USD must be paid for the migration control card. Afterwards, you will enjoy a quick 4 hour flight, with a quick stop at Guayaquil. Once in San Cristobal, passengers must go through an inspection point at the airport to make sure that no foreign plants or animals are being introduced to the archipelago. Also, this inspection point is where passengers have to pay for the entrance to the Galapagos National Park under the following parameters: Adult Passengers $100 and Children $50 (under 12 years old). This is an interpretation center with exuberant gardens and stunning ocean views in contrast with the 1960´s buildings in Charles Darwin Center. Visitors at the interpretation center can learn a lot about the geological and human history of the islands, conservation facts and natural history. This is the oldest museum of Natural History in Galapagos Islands that is trying to preserve the nature of the islands. A short visit to the Galapaguera that is a good place to observe Galapagos tortoises in its natural habitat. San Cristobal island has endemic species such as: The Mockingbird Nesomimus melanotis, lava lizard (Microlophus bivittatus), Chatham Leaf-toed Gecko (Phyllodactylus leei) and the tortoises. All of these species can be observed in this place, the beach is really big, and it works as a nesting zone for marine tortoises. Between January and May, it is common to find the footprints of the female tortoises that have climbed to the sand dunes to deposit their eggs. 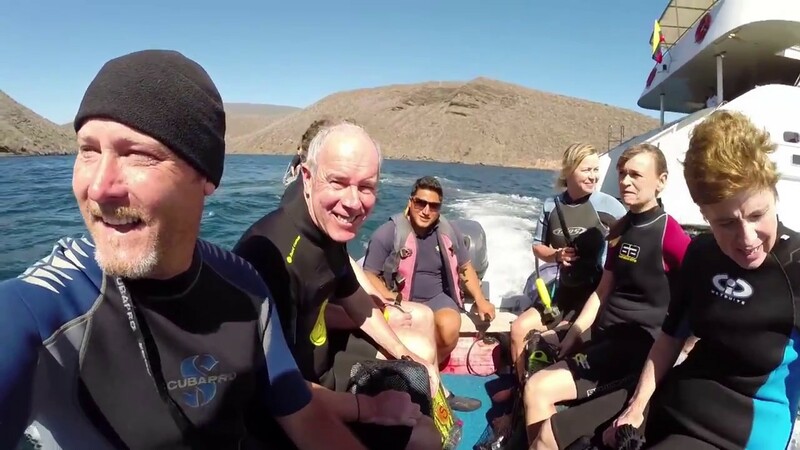 Cerro Brujo is a beautiful white coral beach where you can swim and watch birds and sea lions, plus you can snorkel. This is the first coast where Charles Darwin ever walked on in 1835. In this marvelous lava landscape, you can see seabirds like blue-footed boobies, Nazca boobies, herons, frigate birds and shore birds. The protected bay is very popular to observe young tortoises and for swimming. The pools with salty water behind the sand dunes were used by the fishermen as a salt mine in order to preserve food for the local population. Among the fauna, you can observe the Chatham Mockingbird and the San Cristobal Lava Lizard, both species being endemic to the island and unique to the area as they cannot be observed nowhere else. 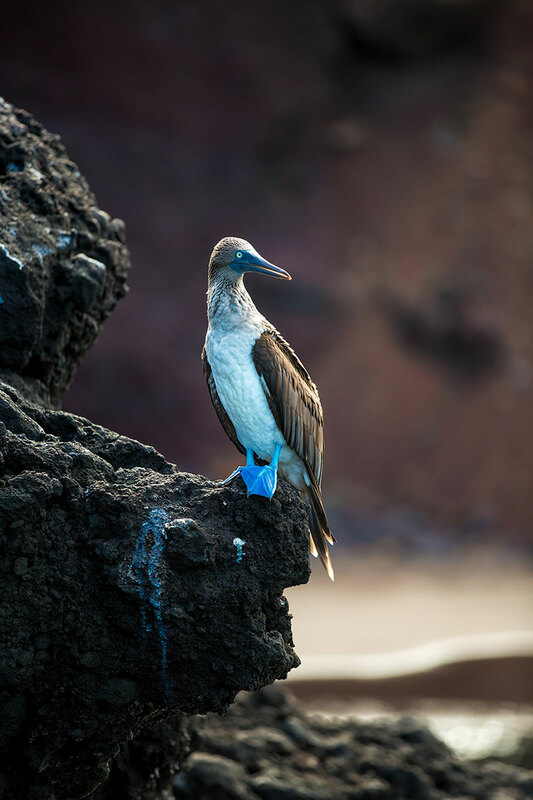 Furthermore, you can find the island canary, the Galapagos turtles and with luck the little bird known as the Pájaro Brujo in Spanish, an endemic specie from San Cristobal Island. The vegetation covers all the route where you can find species like the candelabrum cactus and carob trees. Located on the north coast of Isla San Cristobal, here Cerro Brujo, is the place where we can find a relaxing and beautiful place to be at. Located on the north-eastern coast of Hood, we find Gardner Bay. It provides an excellent beach for relaxing, swimming, snorkeling, kayaking, and the opportunity to observe sea lions. Here we can also observe sharks in the crystal clear ocean waters. 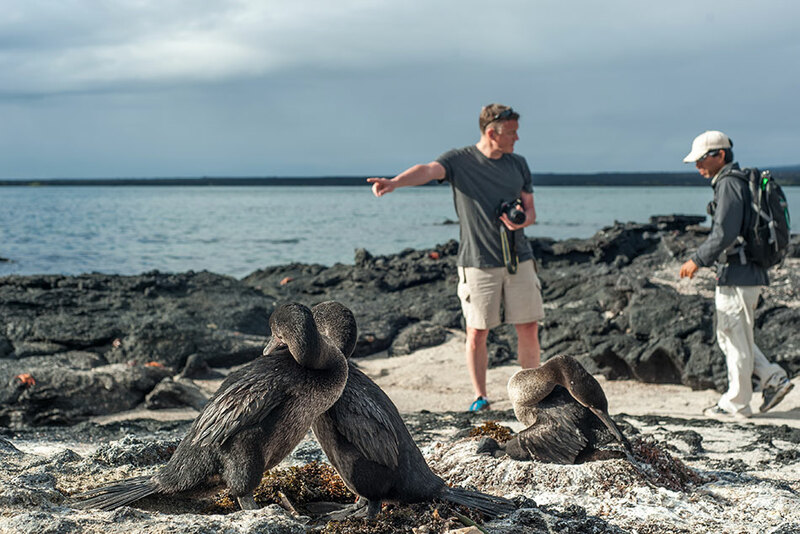 Although the great majority of Galapagos visitors come here to observe and appreciate natural wonders, it is also interesting to learn how the protection and conservation of the islands is carried out. 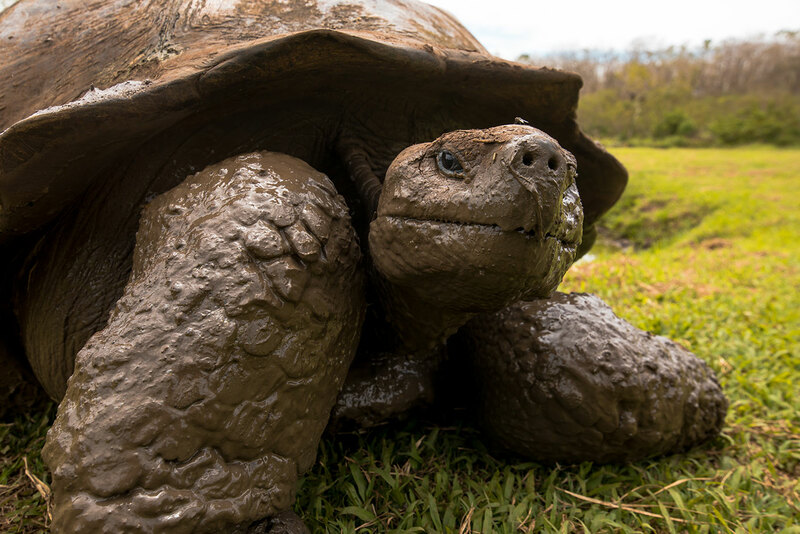 One of the main attractions is the National Park information center, the Van Straelen Exhibition Hall, the Breeding and Rearing Center for young tortoises, Lonesome George (turtle from Pinta), and adult Galapagos tortoises in captivity. Journeying across Santa Cruz into the highlands visitors are delighted by the island’s variety of life and geology. Beginning at the coast and traveling across Santa Cruz the road departs from Puerto Ayora climbing through the agricultural lands and into the mist covered forests. 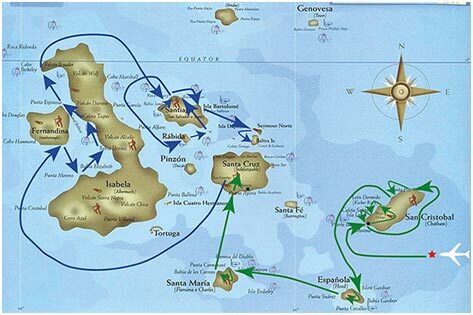 Santa Cruz possesses all of the various life zones present in the archipelago. Birds will surround you across this path. Whether it’s the bright red feathers of a vermillion flycatcher or one of Darwin’s Finch almost every bird present in the islands can be found here. 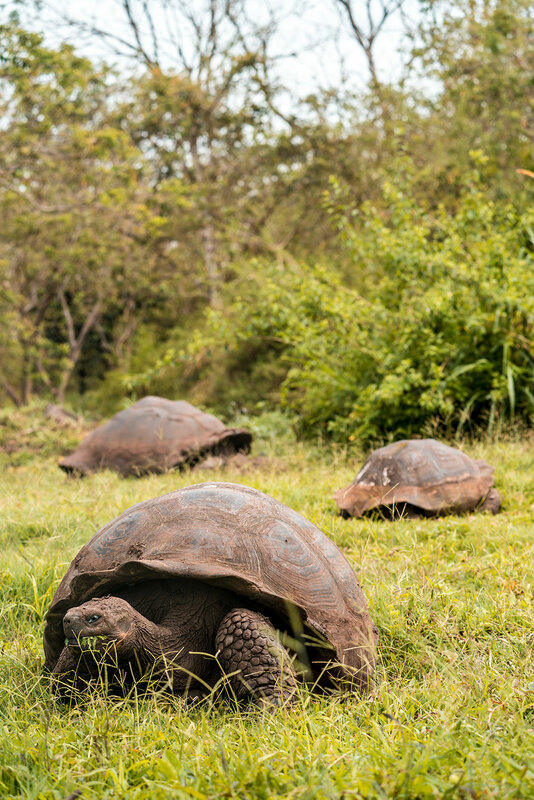 Santa Cruz offers excellent opportunities to observe the wild Galapagos Tortoises. Tracking tortoises is not the only exciting activity to be found in the highlands. There are also plenty of lava tubes, sinkholes and craters ready to be explored. Urbina Bay is located at the base of Alcedo Volcano on the west coast, between Tagus Cove and Elizabeth Bay. This area experienced a major uplift in 1954, which caused the land to rise over 16 feet. The coast expanded half a mile out, leaving marine life stranded on the new shore. This area is also a great place to snorkel. Urbina Bay is a path that starts off with a wet landing. The course is approximately 3200m, and made up of sand, pumice, lava, coral and vegetation where one can observe iguana burrows. It is an ideal place to see red and blue lobster! In Bahia Urbina you can see Darwin’s finches. 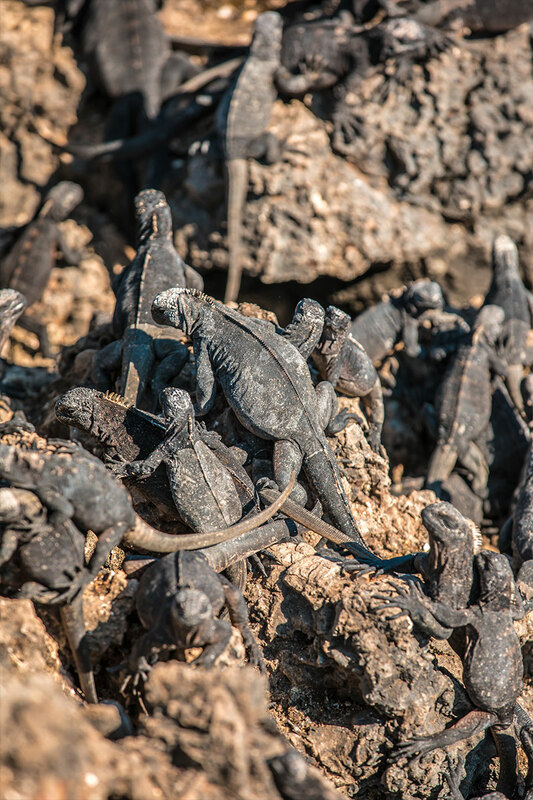 Its main attraction is the land iguanas, which are larger than in places like South Plaza Island and Galapagos tortoises also in the wild, sometimes even out of season they are on the bottom of the islands. A large amount of vegetation can be observed such as chamomile and Rosewood, but among all these plants, the beautiful flowers of cotton Darwin, endemic to the Galapagos Islands stand out. Tagus Cove is located west of Darwin Volcano on Isabela Island. This was a favorite spot for pirates and whalers, and it was them who started the following tradition: the inscription of the names of boats. At the beginning of the trail, you will see a small cave where you will find inscriptions dating to the 1800s. 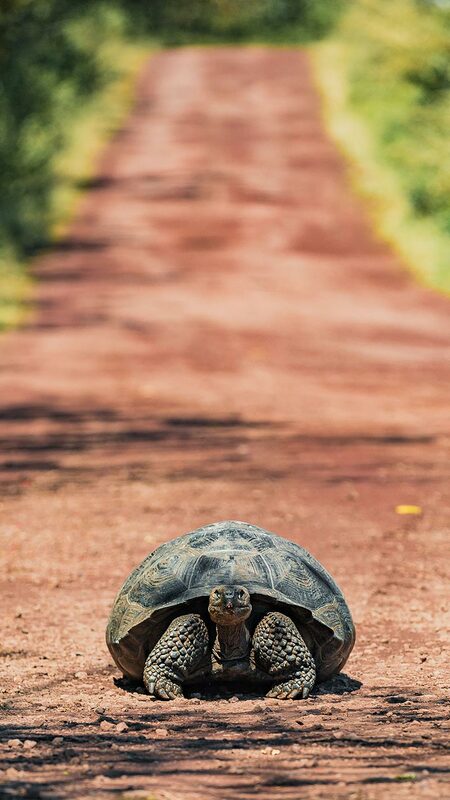 Its name originated from a British warship that went across the islands in 1814 looking for Galapagos Tortoise for food. Due to former eruptions, the substrate has a large amount of volcanic rocks of different sizes, among the most common are little balls of nearly spherical shape known as the “lapilli” or petrified rain. 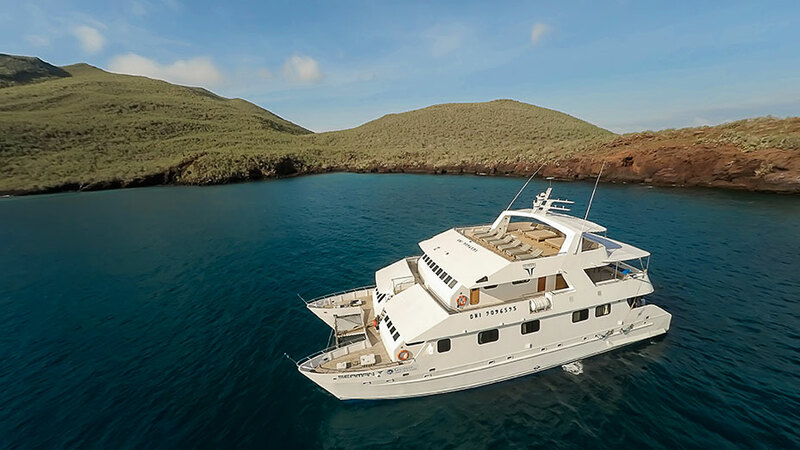 One of the most impressive and spectacular places of the enchanted Galapagos Islands; with high cliffs and tuffstone, ash and lava formations give this area a majestic touch, is Punta Vicente Roca. It is located in the north-western coast of the island; comprises two distinct islets. This large bay has a spectacular marine life. Here, you can see seahorses, sea turtles and the strange yet fascinating Mola-mola or sunfish. This bay is a great place to practice Panga Ride and Snorkeling. 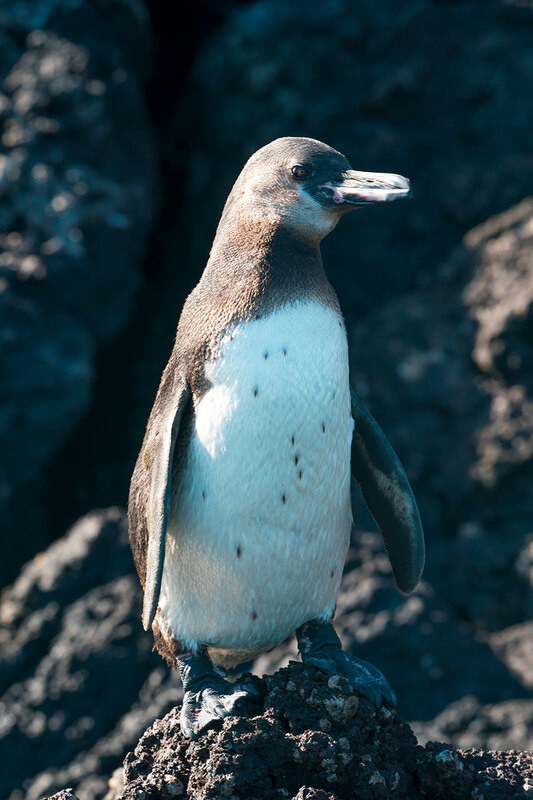 We can as well find: Penguins, Blue-footed boobies, Terns, Boobies, Sea lions. Also, you can snorkel and observe sea turtles, stingrays and puffer fish. 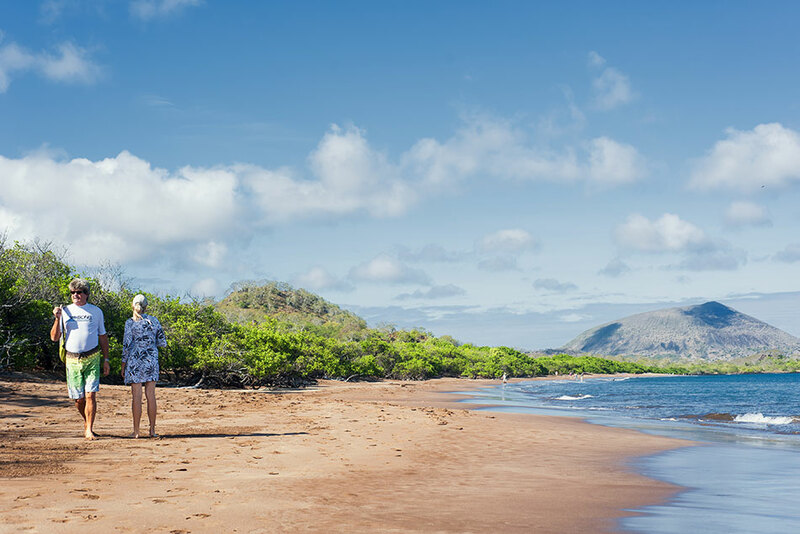 Espumilla beach is located on the northern coast of Santiago Island in James Bay. During the last presence of the El Niño phenomenon, one of the two lagoons in this site, underwent a process of sedimentation, thus causing the disappearance of a representative colony of flamingos. 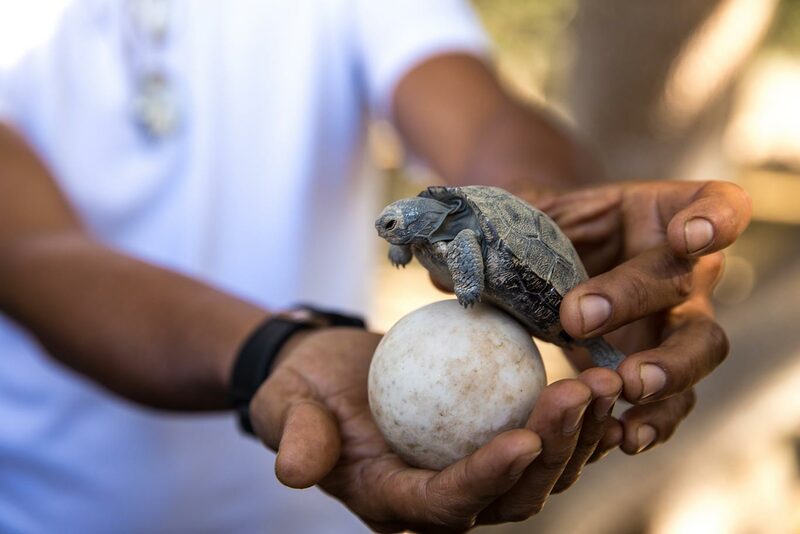 The main attractions are the palosanto forest and the nesting of baby turtles. Its black beach is located on the west side of the island and is the main attraction of the island. Their volcanic tuff deposits have favored the formation of this special black sand beach. This site is called Puerto Egas, because there was an attempt to start the exploitation of salt, which failed because the price of salt in the continent was very cheap and did not justify its exploitation in Galapagos. The project was abandoned, and the infrastructure was left abandoned. Rabida Island is unique due to the red color that colors all rocks and sand. The volcanic material in this island is very porous and external factors as rain, salty water, and sea breeze have acted as an oxidizing agent. A short walk along a trail leads you to a coastal lagoon behind the beach which permits you to observe the land birds such as finches, doves, yellow warblers, and mockingbirds. At the lagoon there is a colony of flamingos. This is a small islet (1 sq km) located just off the southeastern tip of Santiago Island. It is a recent volcanic cone, shaped like a Chinese hat when seen from the north. On the west you can see lava formations, formed under the sea and raised upwards, this is why coral heads are found on the lava. 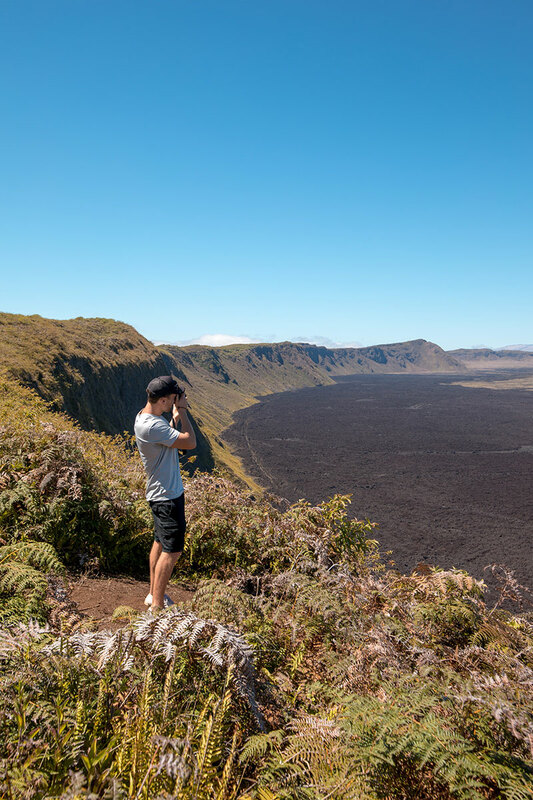 This is an excellent visit for interpretation of geological features such as lava tubes and lava flows. 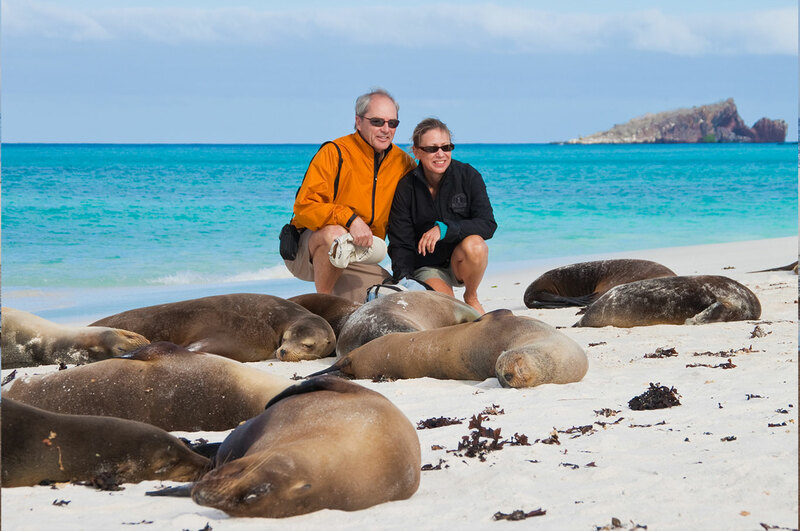 The landscape is covered by sea lion colonies, marine iguanas, and Galapagos penguins. These two small beaches are found to the West of Turtle Cove. Their sand is made of decomposed coral, which makes it white and soft, making it a favorite nesting site for sea turtles. 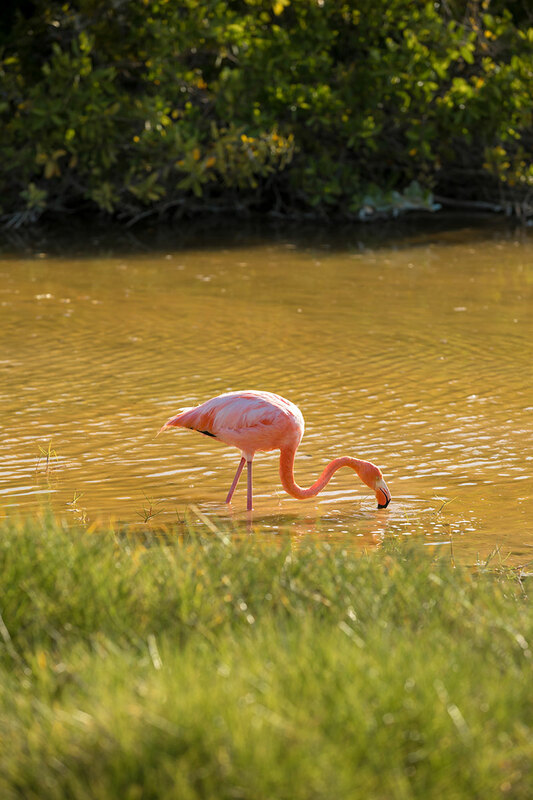 Behind one of the beaches there is a small brackish water lagoon, where it is occasionally possible to observe flamingos and other coastal birds, such as black-necked stilts and whimbrels. The other beach is longer, but it has two old barges that were abandoned during the Second World War, when the USA used Baltra Island as a strategically point to protect the Panama Channel. After the morning excursion you will be taken to the airport for your flight to the mainland.